ADATA is completing its transition to stacked memory, or 3D NAND. This allows for SSDs with bigger capacities without a correlating increase in prices paid by end users. The SX950 uses durable 3D MLC (multi-level cell) NAND Flash and SMI controller. Consumers can choose from 240GB, 480B, and 960GB versions of the SX950. Not only denser (higher capacity), 3D NAND is also roughly 10% faster than 2D NAND and so the SX950 outpaces its predecessor, the SX930 – reaching 560MB/s read and 530MB/s write. The SMI controller and ADATA-designed firmware have been tested extensively with some of the most demanding PC and console titles available. The SX950 features SLC Cache and DRAM Cache Buffer to maintain speeds and withstand high demand periods such as during asset streaming in open world games, texture streaming, and even loading times for large levels. To prolong SSD lifespan, ADATA includes data shaping and wear leveling algorithms in the firmware. RAID Engine is supported for easy integration in drive arrays. 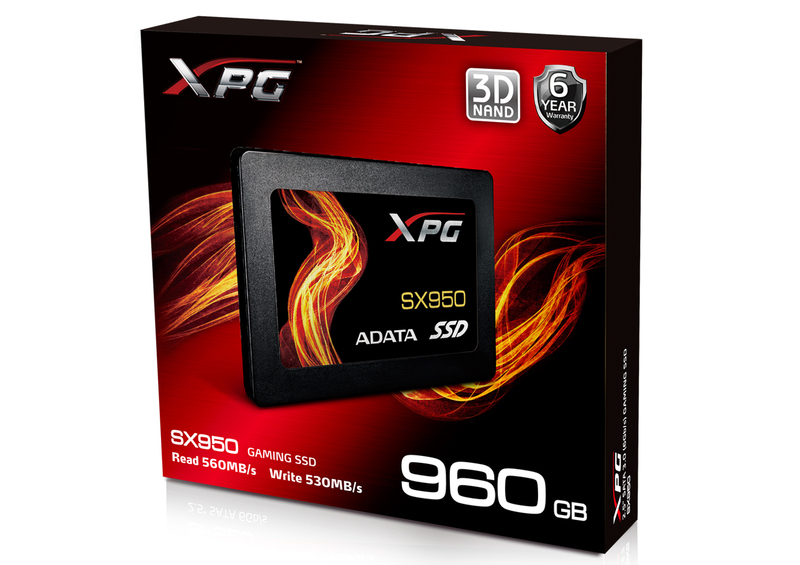 Contrary to bare SSDs, the SX950 lives up to XPG standards by arriving fully loaded. In the box users can find a 2.5mm spacer/riser so the SX950 can easily slide into 7mm and 9.5mm bays on ultrabooks and notebooks. Desktop users can opt to use the included 3.5” bracket and install kit. Either way, the SX950 delivers neat and quick installation on gaming desktops and notebooks. It also provides extended peace of mind with a 6-year warranty backing up its quality. 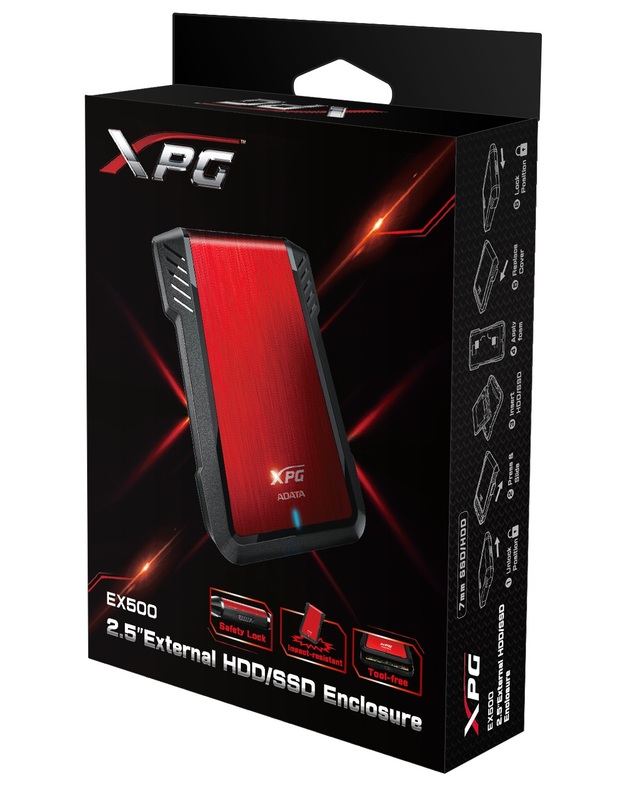 Fitting any 2.5” SSD/HDD, the EX500 offers an aggressively-styled enclosure aimed at passionate gamers looking for storage expansion. Tool-free installation, secure locking, and impact-resistant construction make it ideal for gamers at home and on the go, as it delivers high speed via USB 3.1. The EX500 is “plug and game” compatible with PS4, Xbox One, and PC.